Creamy, warm Artichoke Dip made with garlic, lemon, mozzarella cheese and loads of artichokes! This dip goes fast, so be sure to scoop yourself some before it’s gone! 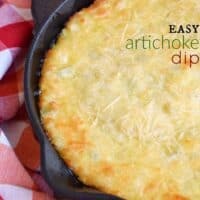 I never know when I make a dip recipe if I’m doing it because I crave the ingredients of the dip, or I want an excuse to eat the crackers! You’d think if it was about the crackers I could save myself a few calories and just eat those. Clearly, with this recipe, it’s about the dip. The more garlic the better too! Although, I never realized how much I love Triscuits until I entered adulthood. As a child, those would never have touched my lips. Seriously. They look like Mini Wheats cereal (which I love now, but hated as a kid). 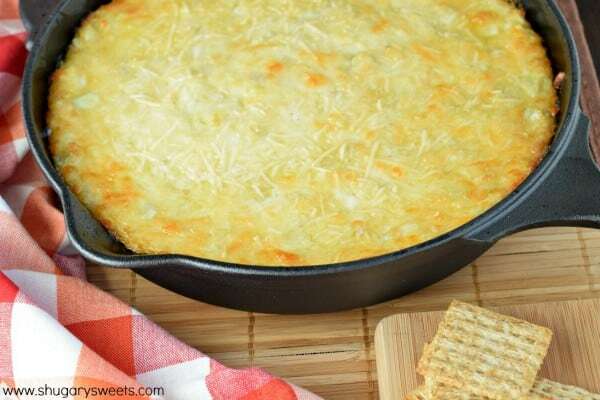 Whipping up this dip is a breeze! Really, it is as simple as that! And I bet if you brought this to a potluck, or made it for friends and family, you’ll be the star of the show! 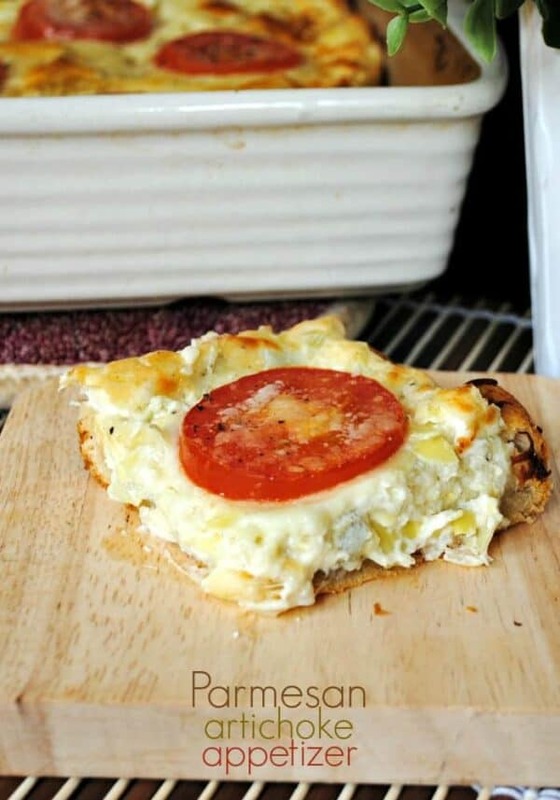 Creamy, warm Artichoke Dip made with garlic, lemon, mozzarella cheese and loads of artichokes! This dip goes fast, so be sure to scoop yourself some before it's gone! Chop artichoke hearts into small, diced pieces. In a mixing bowl, combine artichokes, mayonnaise, cream cheese, mozzarella, garlic, lemon zest, salt and pepper, and 1/4 cup parmesan cheese. Once everything is well blended, spread in an 8-inch baking dish (or a 10 inch cast iron skillet). Sprinkle remaining 1/4 cup parmesan cheese over top of dip. Bake for 25-30 minutes, until bubbly and browned. 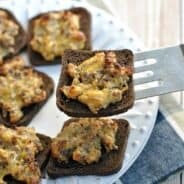 Serve with triscuits, crackers, or bread! ENJOY. 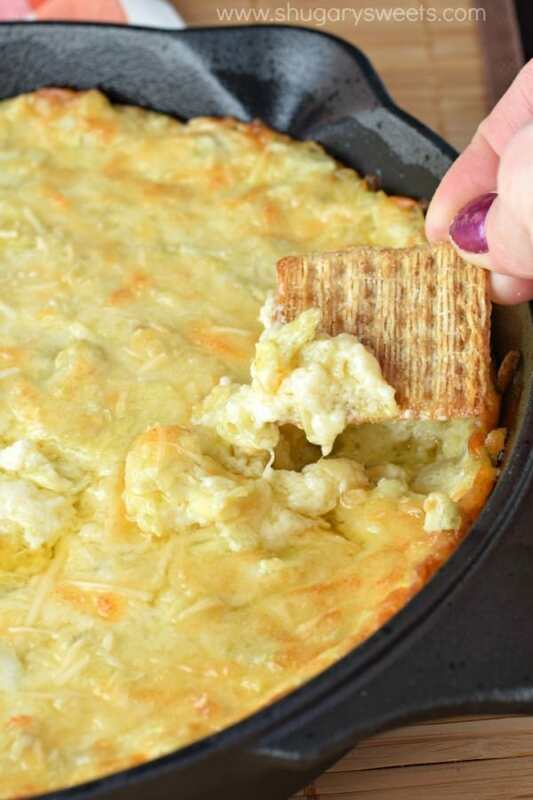 If you love this warm, cheesy dip…here are some more recipes you may enjoy! 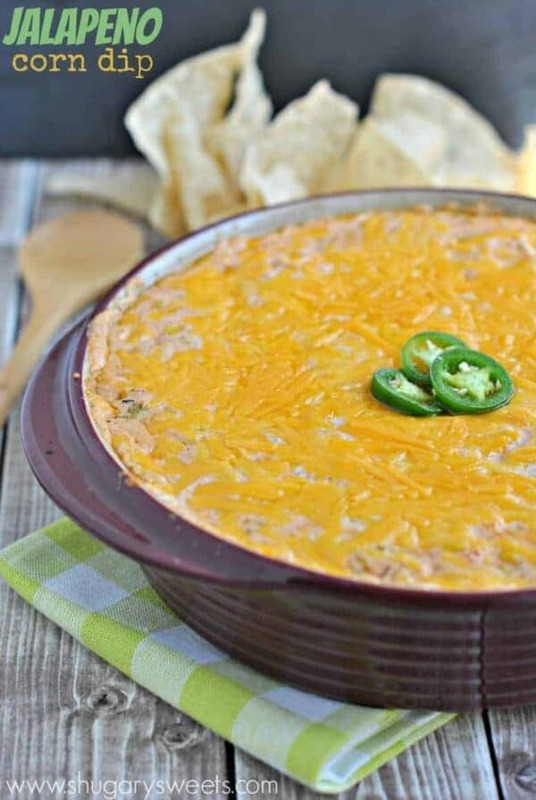 Jalapeno Corn Dip: warm and cheesy with a little bit of spice! 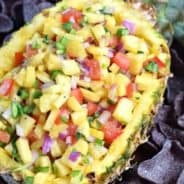 This is truly a game day favorite! 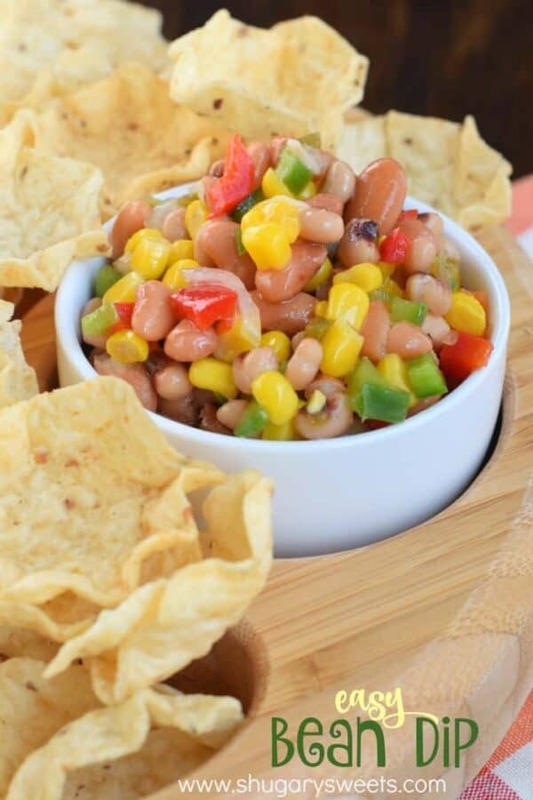 Easy Bean Dip: if you love texas caviar, this homemade Bean Dip recipe is for YOU! Parmesan Artichoke Bread: this snack is perfect for enjoying with a crowd, or having it for dinner! You dramatize the excitement all you want, it’s working! 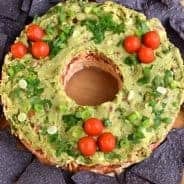 I want some of this amazing dip so so so bad! I could so stuff my face with it all right now! Looks and sounds AMMMMMAZING! 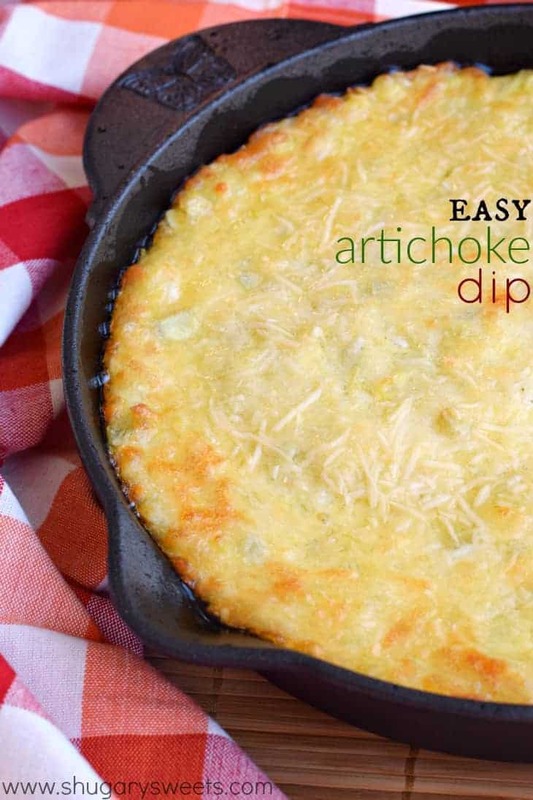 Artichoke dip is just the best. That’s really it. I could eat it all day with a spoon. And Triscuits? Now look what you’ve done! I’ve gotta run to the store and get some. Major craving forming here! What cheesy, gooey deliciousness! I can see why this is a favorite!